When it comes to electric vehicles and self driving vehicles, Tesla is the one that rules the rest. But after a long preparation Tesla postpone the launch of its electric truck due to production issues with the Model 3 and also increase battery production for Puerto Rico. That’s when Daimler AG entered into the scene and debuted its first ever electric truck. 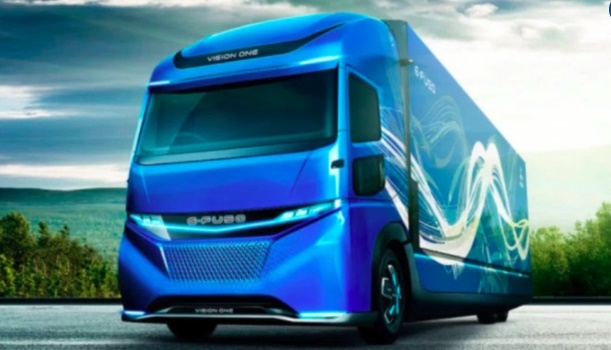 The truck has been named E-Fuso Vision One. The new electric truck by Daimler AG is a prototype that can carry 11 tons of cargo and can travel up to 220 miles on a single charge. Daimler AG, which is one of the most sought after commercial vehicle manufactures in the word, said that the E-Fuso truck, which would be geared to shorter intra-city trips, could go on sale within four years in Europe, Japan and the U.S. This is an extremely great moment for the company but don’t expect to see the trucks on road any time sooner. The firm has revealed that it will officially go on sale within the next four years and be made available in the United States, Japan, and Europe. According to Bloomberg, The E-Fuso underlines the brand’s position as “the frontrunner in electric trucking,” Stuttgart, Germany-based Daimler said in the statement during the Tokyo Motor Show. Fuso last month presented the eCanter, a short-range light-duty hauler for urban deliveries. Now we are waiting to see if Tesla is able to top this announcement with its own semiwhich is scheduled to be revealed on November 16.